This new house boat lies in the beautiful harbour in the Loosdrecht area. Enjoy a wonderful holiday in this unique and luxurious "studio flat" on the lakes, in a beautifully landscaped holiday park. When you rent this accommodation you can make use of various facilities in the park, including bicycle hire. This house boat is furnished like a studio. A wall divides the sleeping area from the kitchen and living area. The bright living room has a spacious lounge area and a dining table from where you can enjoy the stunning views of the water. The adjacent open kitchen is fully furnished, so you can prepare a lovely meal. Experience the ultimate holiday feeling and enjoy exploring this delightful environment, followed by a relaxing massage shower at the end of the day! Water sports lovers are sure to love it here thanks to all the recreational options. In addition to the breathtaking sailing routes, canoes and other water sports equipment can be hired. Nature lovers can explore to their hearts' content along beautiful biking and hiking routes in the Wijdemeren natural areas, near the lakes. The are many charming restaurants and pubs along the lakes. 'Dream on the Water' is beautifully situated on the water, surrounded by green nature in a nice quiet scenery. Nevertheless, the houseboat is easy to reach and you will find sufficient parking space. Arrival: Please park your car on the driveway. You will receive the access code of the walking gate from Belvilla at the confirmation. You walk up the parking lot towards the water. Cross the bridge on your right and follow the path along the water for about 50 meters. You cross a second bridge and continue to follow the path for another 100 meters. 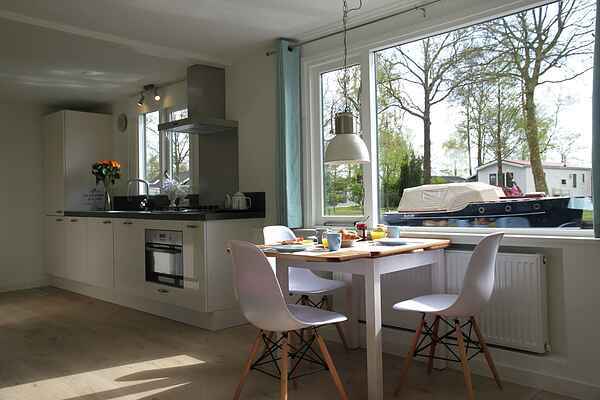 You will find the holidayhouseboat \"Dream on the Water\" on your left. On the shed opposite the ark, you will find the house key in the key safe. This code will be sent to you by Belvilla at the confirmation. In the houseboat you will find an access pass that allows you to use the parking lot throughout the entire stay period. After your stay, please leave the access pass on the table and put the key back in the safe. Thank you very much.